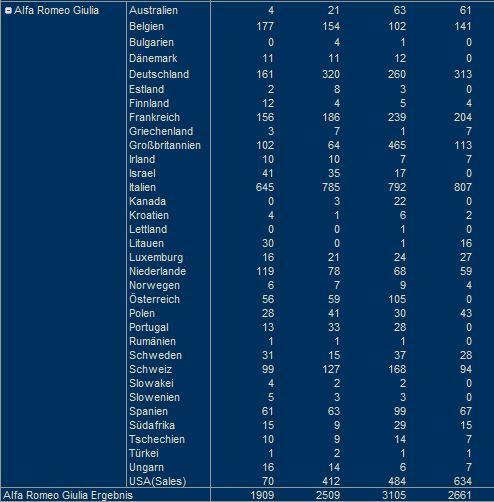 Monthly and annual sales figures for the Alfa Romeo Giulia in Europe. The Alfa Romeo Giulietta was introduced in 2016 as a replacement to the Alfa Romeo 159, which had been discontinued in 2011. It is the first rear-wheel drive sedan for the brand since the Alfa Romeo 75, which ended production in 1992. In March 2017, the Alfa Romeo Stelvio SUV was launched on the same platform as the Giulia. See how Alfa Romeo Giulia sales compare to the other models in the premium midsized car segment. Also find Alfa Romeo Giulia US sales figures. In Italy,only in may Alfa Romeo Giulia sold in 250+ pcs. Something is wrong with your numbers. Are you sure you haven’t mixed up the monthly sales with year-to-date figures? According to my source UNRAE, Italian sales for the Giulia were 189 in May and 256 for the first five months cumulative. On carsitaly.net for may stands 256 pcs sold. Any case, sales is much, much lower then expected. Alfa Romeo as a company inside FCA is nightmare to Sergio Marchionne. Sergio Marchionne is more of a nightmare to FCA. This company needs a leader that can get things done and Marchionne is not the guy. almost 3 years ago I already wrote an article on why Marchionne had been the right guy in the right place for FCA, being the change agent that he is, but why he’s not the right guy to keep running the company in the long term, as I agree with you: Why is Sergio Marchionne still in charge of Fiat-Chrysler? If this is true, BMW sold 10 times more in same period in September. Giulia can’t be competitor so far. I think that not all the options are available on the markets. For example in Finland only diesel is offered and I don’t think it would seem better if petrol was also on offer. But let’s see how the sales develop. I understand why people are hesitating to buy an Alfa.. I drive 159..
Of course FCA expected Giulia to outsell BMW’s 3 Series in a couple of months, even without a wagon model. Alfa is trying to rebuild its name after 20 years of disasters, this will take time (and noone is even sure it will make it). Do you remember where Audi was 20/25 years ago? Customer deliveries of the Giulia haven’t officially started in the US. The 7 registrations in August must have been test cars for the manufacturer or something like that. I agree it looks a bit funny this way, but it’s no indication of how many they’ve actually sold so far. Edit: Giulia and Giulia Ti go on sale in January 2017 with an MSRP of $37,995 and $39,995, respectively. Giulia Quadrifoglio goes on sale this month (December) with an MSRP of $72,000. With this tempo of production and sales, also with upcoming Stelvio, Alfa as a brand maybe only can be saved without progress. This brand is still nightmare inside FCA. Nothing can change my.mind so far. At this rate Alfa sales with Giulia can be projected at over 22000 units. Way less than the target that has been set. More importantly look at numbers from BMW Mercedes Audi and Jag, still growing. If all of these numbers are still growing where is Alfa winning? It’s going to be a bleak year for the brand, FCA will never be able to compete with the big boys, they are too dishonest with their numbers. Are these sales only for the Quadrifoglio? No, in Europe the regular versions of the Giulia are already being delivered, so they include all versions of the Giulia. The US sales figures include only the Quadrifoglio for now, as the regular versions are not yet available there. There’s something wrong with your April numbers, Jato Dynamics give 1.995 registration for EU, if we consider the registrations in EFTA markets Switzerland(97) and Norway(4) the total is 2.096. Probably your error is due to the Italian registration figure from the UNRAE pdf which is wrong, there were 807 Giulia registrations in April and not 708. 2016 – Audi 820000, Alfa 66000 with 2 old models/one body tayp+ Giulia sedan arrival. Alfa dealer network need Giulia SW, new Giulietta with 3,4, 5 doors and Giulietta SUV. Dealer network need time to recover and reach 200000 units in EU.For better result Alfa must renew next generations of Giulia,Stelvio and Giulietta on time without changing names again! Their target is to sell 150.000 of the predicted 400.000 Alfa global sales in EMEA* regions by 2020. Official May figures say Giulia was delivered in Italy at 1.339 units, and 4.000 + since beginning 2017. Stelvio was delivered in 935 units in May. The factory seems now working with increasing capacity. Disaster of sales. This is not FCA expected form new car. Do not believe in better sales in nearest future. They hope to be saved with USA growing market and Chrysler sales there maybe. For better sales in Europe they need wagon model. Giulia sales is ok.Around 26000 and if you imagine 32000+ for wagon you will see ranking nr.4. C clas, A4, BMW 3, Giulia, A5, BMW 4. Next stupid decision is delay with new Giulietta.Next year Giulietta will louse ground. See Boba, decision is SUV Stelvio to be some kind of wagon version of Giulia. But sales after first year is bad, so do not expect 2018 would be better. This car won’t be sold with more than 70-80.000 samples before canceling the project. Launching a new car is expensive and risk movement, specially for brand like Alfa. No bright future, definitely. Let’s drive something else. Try to calculate Giulia wagon for first half 2017.All manufactures have bigger volume of wagons than sedans. Audi A4 first half 2017 78000 x 0,28(28% sedan)= 22000 .BMW 3 series 72000 x 0.33= 24000 sedans. That means Giulia sedan + wagon + poor dealer network outsold Audi and BMW sedans. Alfa 159 was also available as wagon, but collapsed. Similar should be with Giulia. Project should be canceled in nearest future if head of FCA clever and not stubborn. Giulia and 159 are two different planets… I owned a 159 and a BMW 320: no match, 320 much much better. I tested Giulia and both last 320 and Mercedes C models: no match, Giulia much much better. Please, drive a Stelvio, then report us your experience. People who predict end of the brand after only 2 years of launching new models does not understand how market works. For 5 years, nothing was available, only MiTo and Giulietta. Alfa cannot regain all clients in such small amount of time. This is ridiculous thinking. Market would rise again when those cars Giulia and Stelvio will start to massively hit used market in about 3 years. You simply cannot rebuild a brand that fast. I think Giulia wagon is important, but I understand why they are not making it yet. It’s better to focus into redeveloping brand and network. Wagon could come with restyle of Giulia in few years to boost sales. How many Guilia’s were sold in December? In Eruope Giulia sold 25.000 samples. Competitors sold 6 or 7 or 8 times, even 10 times more. Worldwide is even worse for Alfa. After launching this was second year of sales with visible results. This is much much worse then 159 did. Marchionne is big disapointed, now he makes compensation with Sauber with delivery of Ferrari engines to put Alfa brand advertisement to the swiss F1 team. A straw rescue for a sinking ship. Unfortunately but true. More than half Alfas 159 are wagons. Olaf calculated 10 times stronger competition. Maybe A4 and A5 together. That means A4 sedan, wagon, A5 coupe, 4 door coupe and convertible. In Europe 2017 Audi sold A4 sedans around 40.000 pcs. A4 wagons almost 100.000. See Boba, Olaf is right. He describe a total of production of same class of car, without separating to sedan, wagon, coupe, etc…Circulation is measured in millions of sold vehicles…Where is Alfa here? Audi will introduce new CEO Boris Turgenjev. 1.to cansel next generations A5, A4 wagon and allroad. 3.reduce the number of dealers to the same level like Alfa. BMW, Mercedes and Volvo can not wait new CEO! This page is for people to say something clever, not to be war of words. Here is place just to calculate numbers, nothing else. By the way quite frankly, there is no Giulia or Stelvio seen live on the street. But seems you did not made a summary. Step by step. Another bad month for the brand. Marchionne, how do you feel? Worrying signs if a new model like Giulia, which has gotten brilliant press reviews is rapidly losing so many sales already in 2018, have car buyers just lost complete faith in Alfa? Surely this is a disaster for the brand. The sales is 3 times worse then 159 disaster. No need any comment more. Full stop. Stelvio, Giulietta and Giulietta SUV will be the real volume – makers. Giulia did very well. It’s only a sedan with very strong competition. All car industry in Europe collapsed in September 2018. Why?